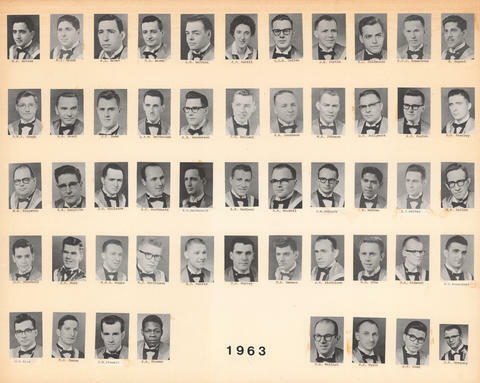 File is a composite photograph the Dalhousie Faculty of Medicine Class of 1963. Photograph includes 52 individual portraits with three photographs of Dalhousie Buildings. Composite photograph includes portraits: M.P. Barcos; M.I. Brook; M.L. Brown; R.L. Brown; L.M. Buffett; J.F. Cahill; G.C.R. Cullen; J.E. Curtis; S.J. Goldstein; R.C.J. Gonsalves; H. Gopaul; D.W.J. Gough; A.R. Grant; J.F. Hamm; L.P.M. Hefferman; R.B. Henderson; J.G. Holland; S.A. Jacobson; W.L. Johnson; G.C. Jollymore; A.S. Kaplan; D.D. Kearney; W.B. Kingston; R.A. Langille; J.G. McCleave; A.C. MacDonald; A.S. Macdonald; A.E. MacLean; A.R. MacNeil; G.W. McQuade; B. Makhan; E.J. Makkay; W.W. Nakkam; A.C. Marshall; J.R. Muir; R.E.P. Munro; A.J. Murchison; D.C. Murray; T.J. Murray; H.A. Newman; P.V. Picchione; R.D. Pike; D.A. Rideout; G.C. Rosenthal; C.A. Ruiz; R.D. Saxon; J.W. Stewart; F.A. Thomas; C.A. Wellish; D.E. Wyatt; J.T. Yang; J.S. Gregory.